They meet in a clash of swords, drenched in the moonlight of Britain’s rugged eastern coast: Captain Jack, his handsome features etched in silver and shadow, his powerful physique compelling Kit Cranmer to surrender. He is her dream lover come vividly alive, and his command of the smuggling gang is absolute. His all-knowing gaze penetrates her disguise as the “lad” leader of a rival gang with frightening ease—and his punishment with kisses leaves her maidenly modesty in tatters. Suddenly, Kit finds she’s only too delighted to explore with Jack the pleasures normally reserved for married ladies… little knowing what dangerous forces she’s unleashing. For even as Kit revels in midnight gallops and cottage rendezvous, Captain Jack is laying a gentle trap that will curtail her freedom… and bind her to him with a ring, a promise… and ties of devotion and desire. Since that told us pretty much nothing, allow me to indulge in a brief plot summary, from the first few chapters: Lord Hendon, having been severely wounded in the Continent, has retired to his country state in Norfolk, eager to rusticate and recover. Captain Jack, his alter-ego, immediately becomes the leader of a large, rough and ruthless smuggling gang, in order to find out how French spies are reaching (and leaving) English shores. At roughly the same time, Lady Kit Cranmer returns home after six rather difficult years in London, subjected to all sorts of social strictures by her aunts, who expected her to make a good marriage and increase their social standing that way. Shortly after her return, Kit falls back into her habit of spiriting away at night, dressed as a male, in order to ride her mare. During one of these outings, mistaken for a lad, she becomes the leader of the local, and much smaller, smuggling gang. Jack, however, must control all the smuggling in the area if he is to succeed in his mission. Hijinks, obviously, ensue. As far as the characters go, I can’t say I fell in love with either of them. 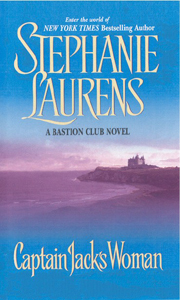 Quite often, I was irritated by their thought processes—to say nothing of their actions—but Ms Laurens’ writing allowed me to get past that and just enjoy the goings-on. A couple of times Kit approached TSTL territory, but some quip or quirk would save her from falling full-length there. Jack’s arrogance made me interrupt the reading several times with sputtered and indignant comments about his presumptions and assumptions, and my s.o. did utter a rather choked “he’s a Neanderthal!” at least once. Of course, considering when the story is set, we can suppose that some of his ideas were commonly held by people of his social class and position, and therefore much less absurd than how they come across now. Two of the secondary characters, George (Jack’s best friend) and Amy (Kit’s best friend and George’s fiancé) are an excellent contrast to the two rather overwrought main characters. There is a particularly funny conversation between the two young ladies, regarding love and how to know you feel it, that is most worthy of reading out loud (by two people is best). I had read this book a few times several years ago, but I had forgotten just how much fun it is. Re-reading it with my s.o. was fantastic on so many levels! Having a male perspective during some of the most improbable scenes lead to so much hilarity we often had to pause our reading until we could breathe again. So the verdict? This is not a great novel, but it is fun and flows quickly. 7 out of 10. You can order Captain Jack’s Woman from amazon.com here and from amazon uk here.